There are only a few characteristics a company can have that guarantee brand recognition, and while boasting at least one of these things says a lot, being able to build a reputation on having two of such company traits is a rare thing. Breville is one such manufacturer that aspires to defy the odds by maintaining a consistency in the quality of the products they produce. While the material that goes into manufacturing is the cornerstone of all quality products, there is another important characteristic that Breville can claim of all if its juicers, and that is innovation. By patenting juicer designs themselves, this manufacturing company has put their name on the map, and they are justifiably looking to keep it there. 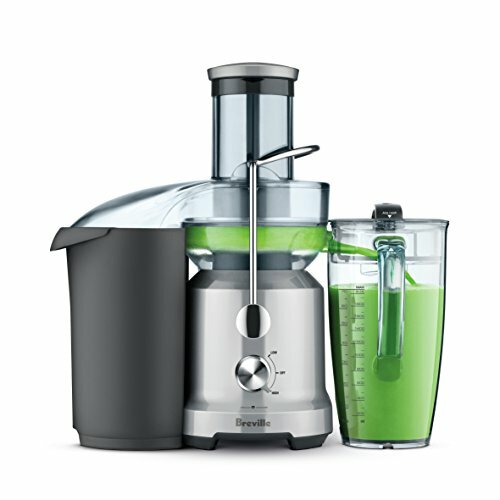 Everyone knows that juicers simply take either a fruit or vegetable and extract as much out of these into drinkable liquid form, but with designs aimed at improving just how much juice their machines can extract, as well as the quality of the juice that comes out, and the features that make using these handy devices easier than ever, Breville Juicers set the bar to a new high that all customers are sure to be satisfied with. A lot can be said, but some things need to be revealed in more detail in order for others to appreciate their true value, and that is exactly what this list of juice extractors does. In order to produce the 8 oz. of juice every 5 seconds, as the JE98XL model is able to do, a lot has to go into the interior design and parts used. 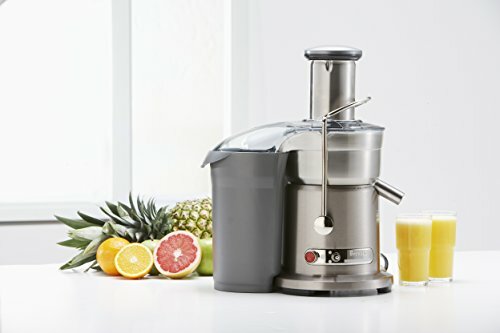 As expected, the stainless steel cutting blade this juicer features is one such high-quality feature, powered by the juice fountain’s 850-watt motor. The motor can be set to operate the blade at two speeds, the first at 6500rpm, and the second at 12,000rpm; this means that the juicer does not shy away from any challenge, no matter how hard the raw material placed in it. As yet one more of a plethora of unique designs, it allows users to easily begin the process by placing produce into the 3” feeder chute, after which the simple click of a button begins to do the job. The processing goes beyond liquefaction, as two built-in features ensure that the extracted juice is both pulp and froth free. Certain measures were clearly featured in the design to add to its durability, such as the safety lock arm that prevents the juicer from functioning when the feeder lid is open, as well as the overload protection feature that shuts down the device automatically to prevent overheating. 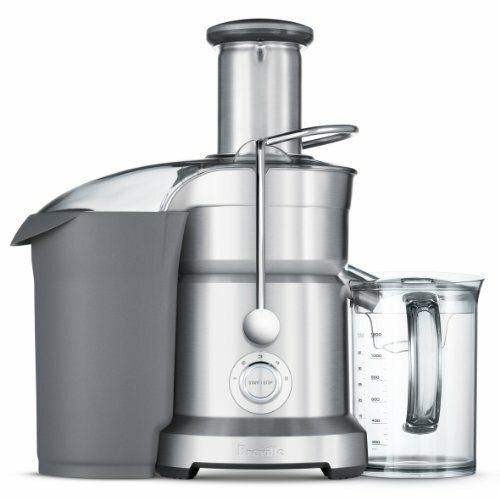 With detachable parts, maintaining the juicer’s cleanliness is made as easy as possible. Though advertised as being suitable for a dishwasher, this is perhaps best left for the gentle care of hand washing, but putting that minor concern aside, there really is no fault with the Breville JE98XL juicer. It is almost easy to forget that the sheer speed in which it extracts juice is one of the main selling points with all that this product has to offer. As the name implies, one of the distinguishing marks of the BJE200XL is just how compact it is, though it is also indicative of a familiar innovativeness that distinguishes Breville products from the rest of what’s out there. Doubts that its size compromises on its effectiveness are quickly put to bed once the 700 watt motor sets the cutting blade speed at 14,000 rpm. At that rate, anything from a banana to a pear can be thrown into the mix with the assurance that the juicer can do the job, and in a short amount of time. Big numbers can also be found among the many features, such as the 3” feeder tube, one large enough to comfortable fit big chunks of raw material, if not entire whole fruits and vegetables. A complimentary jug is offered, able to hold up to 1 liter of whatever has been liquefied, and it is especially convenient as its independence from the rest of the juice fountain allows for versatile use. Once a job is done, a custom cleaning brush that is included in the package helps clean up, and machine washable parts that can be easily detached makes life easier for consumers who have already benefited from the juicer’s effective functionality. Size often serves to indicate whether something is worth the buy or not, and as many consumers of electronic devices can testify, bigger isn’t always better. Tech innovation often leads to a product’s efficiency making it smaller, as smart solutions are created that do not need to take up as much space, as is true with the Breville BJE200XL juicer. Able to pack as many features, as well as just about any ingredient from which juice can be extracted, the Breville BJE430SIL is also able to do so in large quantities, as we will soon explore in greater detail. The first step to handling this great capacity in production is the juicer’s ability to allow for a variation of fruits and vegetables into the 3” feed chute. The produce is then passed to where all the action happens, and with the slow and fast speed settings, the cutter at the base of the center piece is operable either at 6,500 rpm or 13,000 rpm, depending on your preference and what is ideal for different products. The extracted juice is then passed to a large holding jug, able to contain up to 2 liters of juice, and its top cover and portability mean that it can be used to serve drinks directly or conveniently be stored in a location of choice. All this is done in a way in which the least amount of heat is passed on to the end product, made possible by the juicer’s unique design, as expected. As is also expected, all parts that need to be cleaned can be cleaned, and easily so. 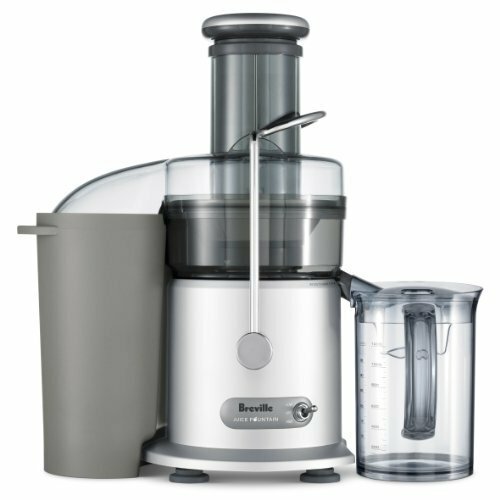 Although the Breville BJE430SIL could do a little more to get the most out of what goes in, the very fact that it can handle a lot ensures that consumers are not left wanting, as there are very few juicers that can hold the 2 liters this included jug does. Other than that, this juicer is what you would expect—more diversity from a pioneering manufacturing company. There are few who approach a juicer and look straight at its motor power, not unless it boasts triple digits, as the Breville 800JEXL’s 1,000-watt motor does. This means that the juicer’s cutting blade can operate at a high capacity of 13,000 rpm, but because customization is often a necessary requirement to making a product one of the best, the speed can be set at a low 6,500 rpm, an ideal rate for softer materials that need juice extracting. The juicer’s durable construct matches its excellent function, as first indicated by its die-cast exterior look and then further validated by the titanium reinforced nutri-disk upon further exploration of its interior. A standard 3” feed tube is featured, a container to hold water, and the expected pulp container to ensure that nothing but pure juice is passed on to the 1-liter jug included. Its cold function also means that the juice, already free from pulp and froth through two different filters, is passed on to its final stage with as little heat from the processing as is possible. As much as having an attractive juicer in the kitchen is something owners might find value in, a device’s interior functions and overall capabilities are what will always be prioritized, and understandably so. The Breville 800JEXL, however, manages to impress through and through, from its exterior looks all the way to its impressive interior functions, and there is nothing more attractive than that. The power gets turned up a notch with the Breville BJE820XL, a juicer with a 1,200-watt motor at its core, boasting some of the greatest capabilities not just within the company’s models, but with all centrifugal juicers in general. Unlike most other juicers, this comes with two cutting disks, including a purée disk for softer material and titanium-reinforced blades that will easily cut into tougher fruits and vegetables. The motor’s potential is converted into useful application when users opt for either one of the 5 speeds the discs can be set to, ranging from 6,500 rpm to 13,000 rpm, all of which can easily be done with the turn of a knob. The feed chute that aligns the centrifugal system is large enough to allow processing of large chunks that makes this juice fountain the effective extractor that it is. With a stainless steel mesh filter basket and a froth separator, the latter fitted on the 1.2-liter jug, the juice produced is as free of pulp and froth as it is rich with nutritious ingredients. Aided by the included cleaning brush, the fact that parts of this durable juice fountain are detachable and can be easily washed is a feature akin to a cherry atop a cake full of ingredients. You would think so much change would begin to bore, but on the contrary, the headache of having to choose from Breville’s many designs speaks well of the company’s intentions, and the BJE820XL is one more model that adds to a great collection. Despite having a simpler design than some of its siblings, and with an exterior that makes it look antiquated, the Breville’s BJE510XL model stands tall next to its close competition. The 900-watt motor it shows off immediately begins the process, and with a nob that features an LCD screen for easy control of its functions, this juice fountain is clearly anything but antiquated. The controller allows users to pick from one of 5 different cutting speeds, ranging from as low as 6,500 rpm to as high as 12,500 rpm. Aside from the large feeder, this makes the juicer able to handle just about any type of vegetable or fruit, and in conveniently large chunks that make the entire process a quick affair. Each of the 5 speeds are labeled by the LCD screen that makes it easy to tell what speed is ideal for that particular produce. Aside from its high-tech functions, it features the standard durable polymer body, a titanium reinforced nutria-disk, and a mesh basket that filters pulp and froth before reaching the 1.2-liter jug, all of these being standard features not lacking from an otherwise unique piece. 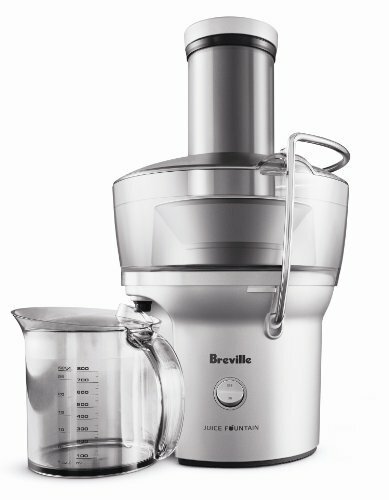 It is products like the BJE510XL that help Breville sit atop the pyramid as the best manufacturers of juicers, and for those with a preference for an old looking design that will do more to impress with modern technology than any other juicer, then this particular make should be an effortless choice. After a review of the best juicers Breville has to offer, it becomes clear that the extent of innovation seems endless as they make minor changes to each model of their appropriately named juice fountains. One thing they all have in common is exceptional quality that encompasses everything you could want from a household appliance such as this.